Born in Niigata prefecture. Graduated from Tainan Normal School in Taiwan; worked as a teacher in Taiwan for 13 years. Returned to Japan after World War II and enrolled in the oil painting department of Musashino College of Fine Arts; graduated in 1956 at age 43. Mokuhan self-taught. First exhibited with Nihon Hanga Kyokai in 1948; member from 1952. Also exhibited with Kokugakai and Graphic Arts Club. Represented at Tokyo Biennale in 1960, 1962, and 1964 and Sao Paulo in 1967. 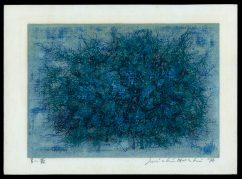 Hoshi was strongly attracted to universal elements of nature and produced elegantly carved images of stars and constellations in the 1960s. Focused on trees in his later years. ** Taken in whole, or in part, with permission from: Merritt, Helen and Nanako Yamada. 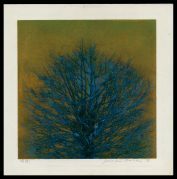 Guide to Modern Japanese Woodblock Prints: 1900-1975. University of Hawaii Press: Honolulu. 1992.